Attic ventilation is a critical component of home energy efficiency and roof health. While many people associate it specifically with relieving summertime heat gain, attic ventilation actually plays an important role in your indoor comfort all year round, all while protecting your roofing system and working to prevent potentially costly problems like ice dams and excess humidity. 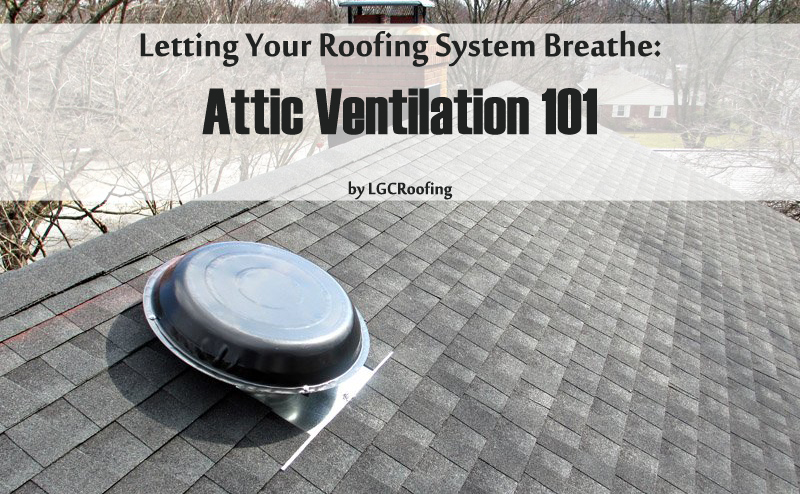 It’s a complex topic, so begin by familiarizing yourself with the basics of attic ventilation. It’s a common construction mistake for a roof to have less than adequate venting. In fact, the American Institute of Architects estimates that nearly 90 percent of American homes have unacceptably high moisture levels. Insufficient ventilation can leave your attic vulnerable to moisture related problems and excessive heat build up. This is especially a problem in older homes. At a basic level, attic ventilation keeps air moving through the upper reaches of your home. This is important because air that stagnates in your attic is more likely to differ significantly in temperature from the air outdoors. This, in turn, can lead to major issues like ice dams and high moisture levels. Ice dams occur when snow that’s accumulated on your roof melts into water, only to freeze again in your gutters. During the winter, when your home heating system is working overtime, warm air rises to your attic. Without proper ventilation, it will collect there, raising the temperature and causing snow on the exterior side of the roof to melt. When this melted snow reaches your gutters, it will freeze again, impeding proper draining and potentially causing thousands of dollars in damage. Moisture and humidity are also major problems that lead to the possible development of toxic mold as well as wood rot and other forms of structural damage. Needless to say these are problems you’d rather avoid, as they can be very difficult and costly to repair, and your homeowner’s insurance won’t cover your expenses. A properly ventilated attic offers a measured, controlled exchange of air between your home’s interior and its exterior. This keeps your attic cooler in the summer while preventing humidity and excess heat buildups in the winter, delivering benefits that support the structural health of your roof and its underlying structural components. Ridge vents/soffit vents: This inexpensive passive strategy introduces a series of strategically placed vents along your roof line and under the eaves to keep air flowing across your attic. Fan-assisted roof vents: This alternative essentially combines roof line vents with the power of electric fans to boost airflow rates and increase active efficiency. Attic exhaust: Exhaust fans are placed in roof gables to draw air out of the attic and expel it on the exterior side of your home. They are usually paired with air intake vents to ensure fresh air is introduced at the right rate. Solar-powered fans: A relatively new addition, this option sees solar-powered fans reduce electricity expenditures while reducing heat gain and humidity in your attic. First, check your attic for signs of moisture. Soggy insulation, condensation on the ceiling, rust around the vents, or moldy odors in the attic are often the result of poor ventilation. Next, clear away any dirt or debris from the attic vents. Make sure the vents aren’t blocked with boxes or other items that may be stored in the attic. You’ll also want to look for bird nests or evidence of rodents. Check to ensure all your attic vents are open, regardless of the season. While it may sound counter-intuitive, a properly ventilated attic should be drafty during the winter. Check any attic fans to make sure the blades turn freely. Use caution, as many fan blades can be very sharp. Now it is also a good opportunity to make sure your attic has an adequate amount of ventilation space. The size of your vents is based on the square footage of the attic. Have your local roofing contractor check whether your vent space is appropriate. Call Your Roofer For Help! 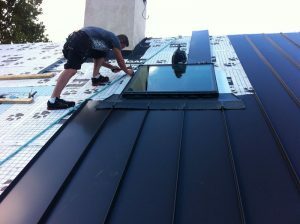 If you’re already experiencing problems, or if you need help adding ventilation, don’t hesitate to hire a professional roofing company to help you. Consulting a professional will help you choose the option that’s right for your home, and professional system design and installation will ensure it functions optimally year-round, protecting your roof and your pocketbook at the same time. Call 609-712-8157 in NJ or (215) 932-7850 in PA to schedule an attic ventilation assessment or inquire about roof vent installation or repair. With over 30 years in the roofing business, LGC Roofing offers expertise & experience necessary to handle all your roofing needs, large and small. We operate throughout the state on New Jersey, and Bucks & Montgomery counties of Pennsylvania, offer Free Estimates and are fully licensed and insured for residential and commercial roofing.